[November, 2017] When I did the pre-release tasting at Loch Lomond (see picture of sample bottle) they asked me: "Can you think of a comparable peaty 25-years old on the market, today?". I smiled and answered "Caol Ila" as the 25-years old Caol Ila was and still is one of my favourite "best-bang-for-your-bucks" whiskies since years. 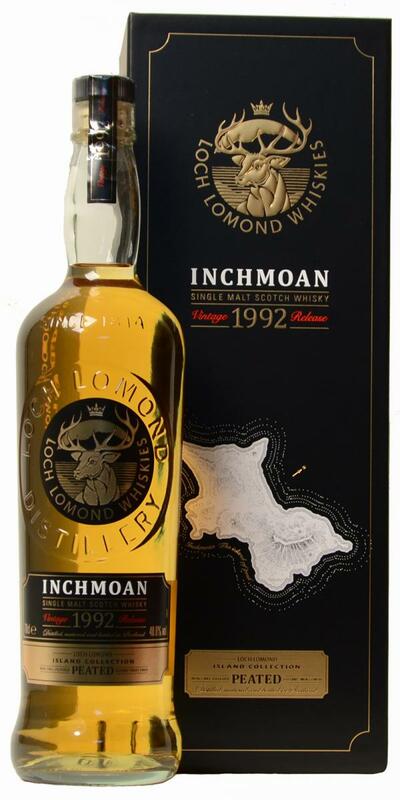 So when I saw a special offer to buy this Inchmoan for 188 Euro I instantly grabbed a bottle to do this head-to-head challenge, finally. So it is this fine Inchmoan (LL) from 1992 versus the most recent 2017 release of the 25-years old Caol Ila (WB id103198) (CI, so most of the casks were distilled in 1992, too). You think this is an unfair competition? No, I know it is not!!! The colour of the LL is yellow gold while the CI is old gold (but remember: Diageo usually adds caramel to adjust the colour). The texture of the LL shows fat sticky tears that very late build very low legs. The CI shows slow legs and late fat sticky tears. Please let both drams breathe for some time. The LL's nose is surprisingly smokey of cold bonfires and tobacco ashes, really flabbergasting for a lowland whisky. It adds powerful malty flavours to this (as if you sniff freshly malted barley from Port Ellen Maltings, great!). Quite complex and interesting to expore, especially the powerful peat-barley combo. The CI offers a complex herbal-peaty profile with tons of cold fireplace ashes and some spicy wooden notes. Actually, I go for a draw on that dimension. 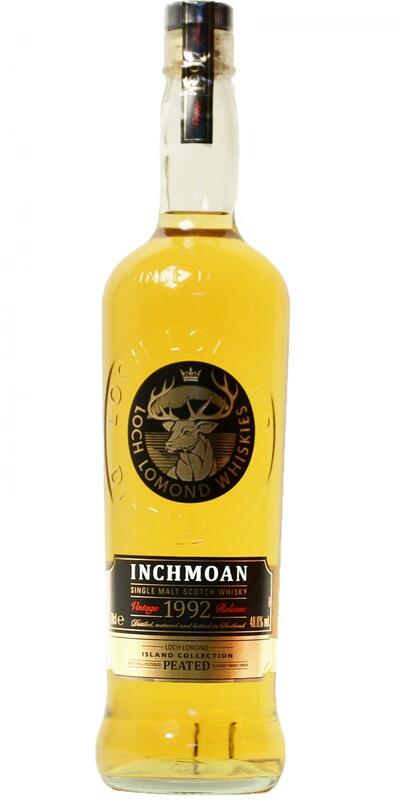 The LL offers a complex and truly multi-layered taste of sweet (honey, barley sugary, liquorice), peaty and fruity (green apples, pears and the like) flavours together with unusual earthy, mineral and farmyard notes. One to explore for hours and still you find new flavours. I like it even better than the first time (okay, I have more than one dram to explore it in detail, now - what makes a huge difference). The CI is more sweet than the LL but a little less complex. I know it sounds "engineered" but this is another draw, again. I swear to be honest, may all the whisky gods be my witness! Water is not needed on both drams - they are perfect just as they are! But if you have more than just a little sample at your hands try them reduced, too, as I can imagine that some connoisseurs might prefer this. The LL arrives on the palate just as the texture promised: instantly it coats the mouth and sticks at it without any distracting moment (neither hot nor astringent nor drying). The CI covers the mouth too, immediately and shows no distracting moment either. I go for another draw (isn't this surprising?). The finish of the LL is very long on mainly (delicious) peaty flavours in a nice sweet and spicy containment, all very balanced. Not a single flaw or distracting feeling here, bottled exactly at the right time! The CI shows a little astringent feeling (too much ashes) so I can declare a winner, finally, and it is the Inchmoan (but just by a nuance). [May, 2017] I had this dram after a very interesting private tour of Loch Lomond distillery that clarified almost all my questions, thanks for that Ibon and Don! The colour is pale gold and the texture shows a lot of sticky fat tears with some of them developing slow legs over time. The nose is surprisingly fresh and complex on a peaty-floral-toffee profile, I like that! The longer I sniff the more aromas pop up - it reminds me a little bit of 20+years old Port Ellen releases from the beginning of this millennium. It arrives very smooth and warming on the palate with no distracting (bitter or astringent) moments and it coats at least the half of the mouth. Again a very nice start to the taste. That is a well balanced mix of mainland peaty, barley sugary and summer floral flavours without any flaws or off-notes. The finish is long and repeats this delicious profile, no bitter or drying notes that I can find. Water is not needed (it opens some more aromas but takes away the power), I like it best when neat. No rough edges, nice sweet peat. The peat is strong, on the ashy side, mixed with the light bourbon flavours that have manifested themselves as a mix of banana, mango and bitter apple. I swear I detect some rhubarb? More peat on the palate than the nose suggested and it has a sweet, fruity side, with no bitter apple now. Some slight fresh pineapple creeps in and it remains sweet and peaty until the end. Little soft peat, petrol, a pungent attack of flavours, peaches, very nice. Delicately peated smoke, sweet fruits, marzipan, baking spices, cream brûlée, toffee and old leather notes on nose. Creosote, spices, pepper, vanilla, oak cask notes on palate. Long finish with spices, oak cask and vanilla notes. Tasted this surprisingly wonderful dram at the 2nd Whiskybase Gathering in Rotterdam, November 2017.
on the nose a surprisingly lovely combination of flavours, lovely layered together. I got several types of orchard fruits, combined with a bonfiresmoke and smoldering wet wood. on the taste is is a full lovely combination with several notes as sweet pear (the famous Perenijsjes), honey, some green apples, layered together with lovely earthy peatsmoke. the finish is long and pleasing, with more notes of juicy pears and subtle smoke and wood tones. i was highly impressed by this dram at the festival, and bought myself a bottle of this one. Though frequently stated as a 25yo, Ibon says this official bottling is actually just shy at 24.5 years. Matured in refill US oak. N: The freshest and the least freaky of the flight. That said, we’ve muddy white pepper aromas with a light yet smokey-meaty character, minced lamb-y pancakes, vanilla cream and curry-like aromatic spices. T: Fruity-to-oily-to-dry [old Bowmore-esque? ], with a development of descriptors towards grapefruit & white pepper, putty/plasticine and caramel. F: Sour-savoury Garibaldi biscuits and putty with an ashy mineral finish. Fab! Angus wrote about that on WF today: http://www.whiskyfun.com/archiveseptember17-2-Lagavulin-Rosebank-Brora.html#230917 Sounds nice, but 200 EUR for a peated LL 25y? Maybe yes!